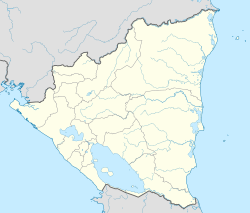 Bonanza, Nicaragua (Spanish pronunciation: [boˈnansa]) is a municipality in the North Caribbean Coast Autonomous Region of Nicaragua. In 1996, the local authorities chose for the first time to vote. Bonanza has a population of approximately 19,000 inhabitants. The majority of the population are of mestiza origin and banana cultivation is important for the economy. The gold mining activity in Bonanza also attracted the population of many parts of the world in the search of the metal. The town is served by San Pedro Airport. Wikimedia Commons has media related to Bonanza (Nicaragua). This page was last edited on 23 July 2017, at 06:49 (UTC).